I made some juices to kick start my Thursday, and naturally I photographed them, so I figured I would share ’em with all of you for potential recipe inspiration. I’m going climbing in South Boston at noon for the day, so it was the most opportune time for me to stack up on my micro-nutrients. 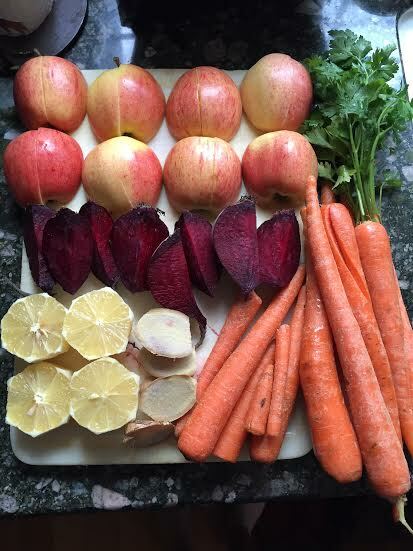 The ingredients are as follows: Gala Apples, Parsley, Beet, Lemon, Ginger and Carrot. I call this one the “C’est Parfait”… it means “it is perfect” in French and, well, it is. 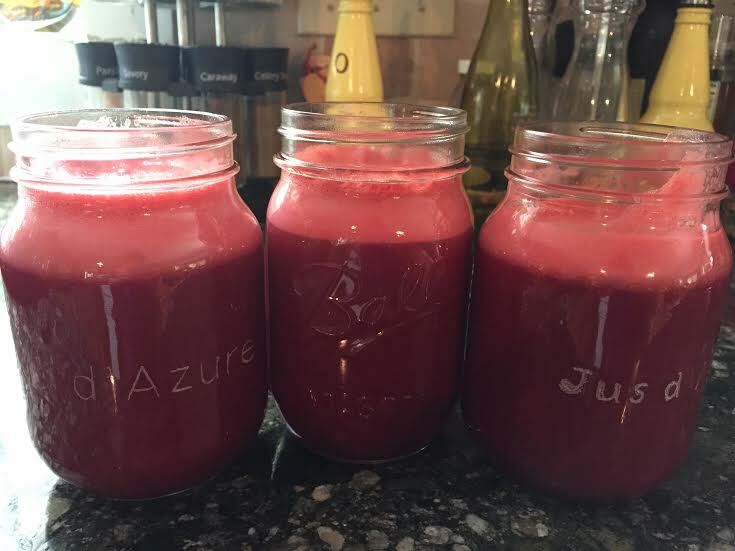 Now, I obviously used a lot of ingredients to yield a solid amount of juice because I tend to make extra for la famille, but if anyone needs or wants the ratios for personal sizes, just let me know. Here’s the second one. It’s not as sweet and tantalizing as the C’est Parfait, but this one packs a nice health punch and really gets those juices flowing – pun intended. This one doesn’t have a name in my mind yet, but the ingredients are as follows: Cilantro, Tomato, Red Pepper, Lime, Parsley, Jalapeno, Celery, Garlic, Spinach and Kale. It’s sort of reminiscent of a Bloody Mary, so maybe a name like the Juicy Mary could work? I don’t know. Ideas are welcome! Now I know having Garlic in a juice may sound weird and unappealing, and at first it may be strange, but you really actually start to enjoy the zing it gives you. I also only add one clove so it’s not overwhelming, yet you still get all the glorious benefits that garlic has to offer – and believe me, there are plenty. Well, I’m off to climb. Have a great day! Stay fabulous. 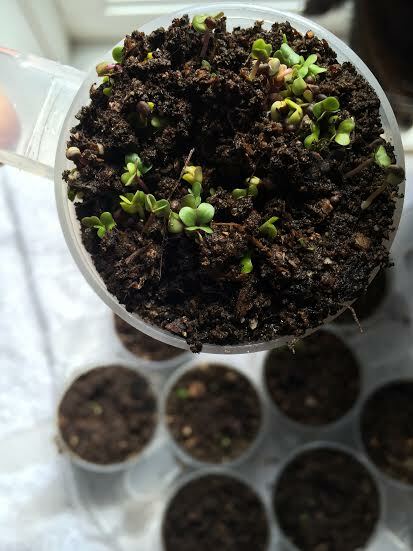 As you may or may not know, Earth Day was on April 22nd, and to keep up the good vibes, I planted some old seeds that I had leftover from my Vermont days. To be honest, I was a little nervous as to whether or not the seeds would actually sprout, since those things are said to have expiration dates. Nevertheless, I collected a wheelbarrow full of very old horse manure – which is now beautiful compost equipped with earthworms (!!!) 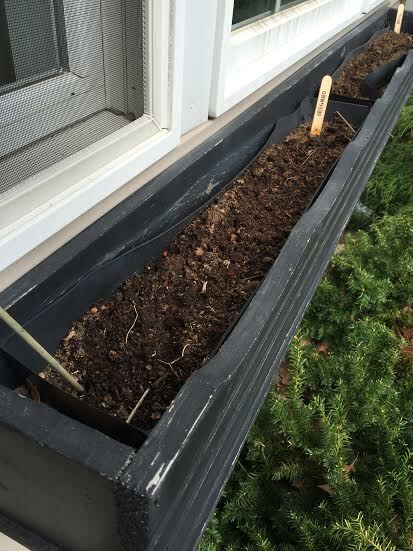 – tidied up the window boxes in front of my house and planted within them large handfuls of the “expired” seeds. I also up-cycled old protein scoops that I have been hoarding for some time now and planted seeds in them to hopefully sprout indoors. The above photo is the up-cycled protein scoop – crafty idea, huh? I thought so. However, at the aggressive rate that the Dinosaur Kale is growing, they won’t be in the scoop for long! The last time I tried growing Lacinato (Dino) Kale, they made it pretty far, only to get devoured by deer a few days before cultivation. Mer. Wish me better luck this time. May my heart be kind, my mind fierce and my spirit brave. Apparently, I am known as the resident garbage disposal; and you know what? I’m totally okay with that. Actually, I dig it. 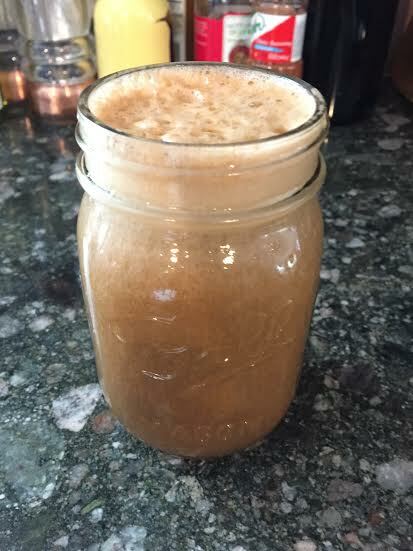 I am the girl at work who saves the pineapple rinds to juice because there is actually juice hidden in there; I save lemon peels and put them in my water because it does add a lemony flavor, and when I have to flush out the juicer after juicing a beet so I don’t taint the color of future juices… I drink the beet runoff. Yes, I can’t stand to waste water, either. Truth be told, I absolutely hate wasting things in general, especially food. Hell, I up-cycle plastic protein scoops and turn them into vessels for sprouting seeds. It particularly tears at my heart every time I have to throw something edible away, knowing that there are multitudes of starving people scattered all over the globe; some even as close as downtown. I’ve been fortunate enough to grow up in a household where I am well fed, but that doesn’t mean I am oblivious to the needs of others. That’s partially why I bought a dehydrator: to salvage things that are about to go bad. It’s just who I am, and I’m proud of that. Waste not, want not, so the saying goes. Anyway, going along with that theme, I came across this article a few weeks back, and I think it pertains to this post quite nicely. It’s in regards to making the most of certain fruits and vegetables, and I’ve copied the majority of the article below. I’m proud to say that I actually already do all of these things (except #5) because I’m about that life, but I bet some of these things are new for you, so read on! The white, pithy flesh on the inside of orange peels is packed full of bioflavonoids which enhance your body’s utilization of the vitamin C in the orange. The bioflavinoids hesperidin and diosmin found in the orange pith may also help to heal varicose veins and improve the appearance of your skin. Simply scrape off the inner white part of the peel with your teeth. Many people don’t know that the skin of a kiwi fruit is edible. Thinly slice the kiwi fruit and leave the skin on. The taste and texture complement one another nicely when prepared this way. If you peel off the skin and throw it away, you are missing out on added fiber, vitamin C, and even omega 3 fatty acids! Beet roots are well known as a nutritional powerhouse but many people neglect the greens. Don’t trash the tops! They contain many vitamins and minerals including iron, potassium, magnesium, calcium, phosphorus, iron vitamins A, C and K, folic acid and more. Beet greens make a delicious side dish lightly sautéed with some garlic and olive oil. 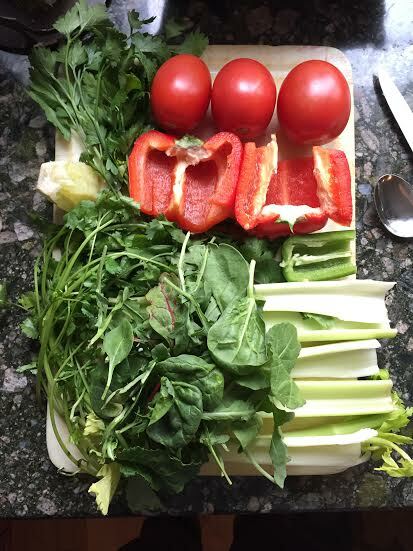 You can also juice the stems and leaves. When eating raw or steamed broccoli, many people prefer the florets to the stems and leaves, but the they can also be tasty when prepared in a way that works with their taste and texture. Use julienned stems in a slaw with cabbage and carrots or add sliced stems and leaves to a stir fry. Don’t throw away the ends of carrots or celery, potato skins, onion and garlic skins, the stem of cauliflower or carrot tops! Throw them in a bag in the freezer and make a vegetable stock when the bag is full. Add to last night’s chicken carcass for an almost free chicken stock. Bonus tip: Freeze the stock in ice cube trays as a healthier alternative to bouillon cubes. Add a broth cube when cooking quinoa, rice or veggies for extra flavor and nutrition. **One of my horses actually LOVES the juice pulp as it is, so that’s another method to not waste; just make sure you cut the rinds off prior to juicing. Adding the pulp to a compost pile outdoors is another way to really amp up your garden. Have a fantastic rest of your “hump day”, my friends! Keep away from people who try to belittle your ambitions. Small people always do that, but the really great make you feel that you too, can become great. When you are seeking to bring big plans to fruition, it is important with whom you regularly associate. Hang out with friends who are like-minded and who are also designing purpose-filled lives. Similarly be that kind of a friend for your friends. Now, those are words to live by; don’t you forget them!